It has been suggested that High Speed Rail (London - West Midlands) Bill Select Committee be merged into this article. (Discuss) Proposed since April 2019. 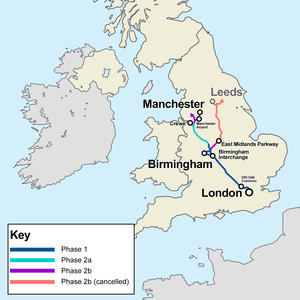 High Speed 2 (HS2) is a high-speed railway awaiting construction in the United Kingdom which, when completed, will directly connect London, Birmingham, the East Midlands, Leeds and Manchester. Scheduled to open in phases between 2026 and 2033, high-speed trains will travel up to 400 km/h (250 mph) on 330 miles (530 km) of track. HS2 will be the second high-speed rail line in Britain, the first being High Speed 1 (HS1), which connects London to the Channel Tunnel, commissioned in the mid-2000s. When complete, HS2 will configure the letter "Y": London at the base, Birmingham at the split, Leeds top right, Manchester top left. Phase 1 – from London to the West Midlands, with the first services scheduled for 2026. Phase 2 – from the West Midlands to Leeds and Manchester, scheduled for full completion by 2033. Phase 2a – from the West Midlands to Crewe, with the first services scheduled for 2027. Phase 2b – from Crewe to Manchester, and from the West Midlands to Leeds, with the first services scheduled for 2033. Peak hour capacity at the HS2 London terminal at London Euston is predicted to more than triple when the network is fully operational, increasing from 11,300 to 34,900 passengers each way. Services on the new routes will be provided by two fleets of trains: One dedicated only to the high-speed track, named "captive" trains, servicing Birmingham, Leeds, London and Manchester; the second fleet extends the reach of HS2 to cities on the existing "classic" network by operating on a mixture of high-speed track and existing slower tracks, named "classic compatible", serving Carlisle, Chesterfield, Edinburgh, Glasgow, Liverpool, Newcastle, Preston, Sheffield and York. HS2 is being developed by High Speed Two (HS2) Ltd, a private company limited by guarantee established by the UK government. In July 2017, decisions on the full "Y" route were approved by Parliament and the complete project is estimated to cost £56 billion. Construction of Phase 1 began in 2017. High-speed rail arrived in the United Kingdom with the opening in 2003 of the first part of High Speed 1 (then known as the 108 km (67 mi) Channel Tunnel Rail Link) between London and the Channel Tunnel. The assessment of the case for a second high-speed line was proposed in 2009 by the DfT under the Labour government, which was to be developed by a new company, High Speed Two Limited (HS2 Ltd). Following a review by the Conservative–Liberal Democrat coalition, a route was opened to public consultation in December 2010, based on a Y-shaped route from London to Birmingham with branches to Leeds and Manchester, as originally put forward by the previous Labour government, with alterations designed to minimise the visual, noise, and other environmental impacts of the line. In January 2012 the Secretary of State for Transport announced that HS2 would go ahead in two phases and the legislative process would be achieved through two hybrid bills. The High Speed Rail (London – West Midlands) Act 2017 authorising the construction of Phase 1 passed both Houses of Parliament and received Royal Assent in February 2017. A Phase 2a High Speed Rail (West Midlands – Crewe) bill, seeking the power to construct Phase 2 as far as Crewe and make decisions on the remainder of the Phase 2b route, was introduced in July 2017. In November 2018, Andrea Leadsom MP questioned the viability of the project at a meeting of the all-party parliamentary rail group. In response, HS2 suggested some changes to the project, to keep it within budget. These included: reducing train speeds by 30 mph (50 kph), reducing the frequency from 18 to 14 trains per hour and changing from slab track to ballasted track. CEO Mark Thurston was quoted as saying: "If, at some point in the future, we are instructed to consider any of these options, then more detailed work on the effect of such changes would of course take place..."
See also: Geographic data related to proposed route of HS2, phase 1 at OpenStreetMap. Phase 1 will create a new high-speed line between London and Birmingham by 2026. A high-speed link will also be provided to the existing West Coast Main Line (WCML) just north of Lichfield in Staffordshire, which will provide services to the North West of England and Scotland, in advance of later phases. Four stations will be included on the route: the London and Birmingham termini will be London Euston and Birmingham Curzon Street, with interchanges at Old Oak Common and Birmingham Interchange respectively. From the London end, the route will enter a twin-bore tunnel at the Mornington Street bridge at Euston Station's throat. After continuing through the underground station at Old Oak Common, an 8-mile (13 km) tunnel follows until West Ruislip, where trains emerge to run on the surface. The line crosses the Colne Valley and the M25 on a viaduct, and then through a 9.8-mile (15.8 km) tunnel under the Chiltern Hills to emerge near South Heath, northwest of Amersham. It will run roughly parallel to the existing A413 road and the London to Aylesbury Line, to the west of Wendover in what HS2 call a 'green tunnel'. This is a cut-and-cover tunnel which has soil spread over the final construction, to enable it to be used for agriculture or amenity. After passing west of Aylesbury, the route will run along the corridor of the former Great Central Main Line, joining the former line north of Quainton Road to travel through rural North Buckinghamshire and Oxfordshire up to Mixbury, south of Brackley from where will cross the A43 and open countryside through South Northamptonshire and Warwickshire. North of a bored tunnel under Long Itchington Wood, the route will pass though rural areas between Kenilworth and Coventry and cross the A46 to enter the West Midlands. Birmingham Interchange station will be on the outskirts of Solihull, close to the strategic road network including the M42, M6, M6 toll and A45; the route will feature viaduct crossings of all these roads. North of the station, a triangular junction (known as the 'delta junction') west of Coleshill will link the HS2 Birmingham city centre spur with the line continuing north, from which Phase 2a and 2b will be developed. The northern limit for Phase 1 will be a connection onto the WCML near Lichfield. This part of the line would be operative with compatible high-speed trains moving onto the classic track WCML while the western leg of Phase 2 is being built. The city centre spur will be routed along the Water Orton rail corridor, the Birmingham to Derby line through Castle Bromwich and in a tunnel past Bromford. In November 2015, the then Chancellor, George Osborne, announced that the HS2 line would be extended to Crewe by 2027, reducing journey times from London to Crewe by 35 minutes. The section from Lichfield to Crewe is a part of Phase 2a planned to be built simultaneously with Phase 1, effectively merging Phase 2a with Phase 1. The proposed Crewe Hub incorporating a station catering for high-speed trains will be built as part of Phase 2a. In November 2016, Phase 2 plans were approved by the government with the route confirmed. Phase 2 will create two branch lines from Birmingham running north either side of the Pennines creating a "Y" network. Phase 2 is split into two phases, 2a and 2b. Phase 2a is the section from Lichfield to Crewe on the western section of the "Y" and Phase 2b is the remainder of Phase 2. This section of the "Y" route extends north from Lichfield connecting to the northbound classic WCML at Bamfurlong south of Wigan taking services to Scotland, with a branch to the existing Manchester Piccadilly station. A branch onto the WCML at Crewe takes trains on classic track 64 km (40 mi) forty miles into Liverpool. This section of the "Y" branches at Coleshill to the east of Birmingham and routes north to just before York where it connects onto the northbound classic ECML projecting services to the North East of England and Scotland. This is an extension of the Phase 1 line that terminates north of Lichfield where it connects to the West Coast Main Line (WCML). The line will extend north to the proposed Crewe Hub. Opening a year after Phase 1, most of the construction will be parallel with Phase 1. An updated station at Crewe to cope with high-speed trains. A tunnel under Crewe station to allow HS2 trains to by-pass the station remaining on HS2 tracks. A branch onto the WCML just to the south of Crewe station to allow trains to enter the station from the south. A branch onto the WCML just to the north of Crewe station to allow trains to enter the station from the north. Allows trains from the north and south to run off HS2 track onto classic lines splaying from the existing comprehensive junction. Allowing northbound trains to by-pass the station using the tunnel under the station and run onto the WCML north of the station. HS2 track continues north from Crewe with its end point at Bamfurlong south of Wigan where it branches into the WCML. As the line passes through Cheshire at Millington it will branch to Manchester using a triangular junction. The Manchester branch then veers east in a circuitous route around Tatton running past Manchester airport through a station at the airport, with the line then entering a 16-kilometre (10 mi) tunnel, emerging at Ardwick where the line will continue to its terminus at Manchester Piccadilly. East of Birmingham the Phase 1 line branches at Coleshill progressing north east roughly parallel to the M42 motorway, progressing north between Derby and Nottingham the line ends by branching into the northbound ECML south of York, projecting services to the North East of England and Scotland on a mixture of HS2 and classic tracks. The line from Birmingham northeast bound incorporates the proposed East Midlands Hub located at Toton between Derby and Nottingham. The East Midlands Hub will serve Derby, Leicester and Nottingham. There will be a parallel spur to the northbound HS2 track using the classic track Midland Main Line from a branch at Clay Cross branching back onto HS2 track east of Grimethorpe. Chesterfield and Sheffield will be served by HS2 classic compatible trains being located on this spur. HS2 track will branch directly into a Leeds HS2 terminus. The initial plan was for the line to serve Sheffield directly via a new raised station adjacent to Tinsley Viaduct, near to Meadowhall Interchange east of Sheffield as the line progresses north. This met with opposition from Sheffield Council, who lobbied for the line to be routed though Sheffield city centre. As a result, Sheffield will be accessed via a spur using existing classic tracks, to the benefit of Chesterfield which will gain a HS2 classic compatible service. A branch will take the HS2 line to new high speed platforms constructed onto the side of the existing Leeds station. Completion is scheduled for 2033. Changes were made to the eastern leg of the HS2 "Y" route through South Yorkshire, with Meadowhall on the outskirts of Sheffield being dropped from the scheme. The city of Sheffield will be served directly to its city centre at Sheffield Midland station via the Midland Main Line classic track. A spur will be created by a branch off the main HS2 track at Clay Cross onto the Midland Main Line via Chesterfield. HS2 will branch back onto HS2 track east of Grimethorpe, north of Sheffield. There are suggestions for a new 'South Yorkshire Hub' station to be built to replace Meadowhall. The proposal is a future hub near Thurnscoe, Rotherham or Dearne Valley. The plans were backed by Sir David Higgins, head of HS2 Ltd, in December 2016 and would see a new South Yorkshire Parkway Station. In January 2017, the government published eight possible sites for the hub across South Yorkshire and also said they would consider a 'South Yorkshire Hub'. Sites being considered include: Bramley in Rotherham, South Yorkshire, Clayton in Doncaster, South Yorkshire, Fitzwilliam in Wakefield, West Yorkshire, Hemsworth in Wakefield, Hickleton in Doncaster, Hooton Roberts in Rotherham, Mexborough in Doncaster and Wales in Rotherham. In July 2017, MPs called for the government to build a parkway station on the planned HS2 route through South Yorkshire after the government confirmed the HS2 route would be the M18 Eastern Route. Transport Secretary, Chris Grayling confirmed in a letter to MP John Healey, the MP for Wentworth and Dearne, that a parkway station in South Yorkshire is ongoing and that Grayling and the other local MP's were pushing for the case of a station. In September 2017, leaders called for a station in South Yorkshire, while HS2 Ltd said any new station would require a consultation and that they were still assessing the eight sites proposed in January 2017. Any new station would have to be near to the existing railway lines in order to provide the best benefits of HS2. In December 2017, the chairman of HS2 ordered a decision on the HS2 parkway station in South Yorkshire to made soon and also confirmed that only three options were being assessed. The decision will need to be made before a final decision in Parliament is made in 2019. There are no DfT proposals to extend high-speed lines north of Leeds to Newcastle, west of Manchester to Liverpool, or to Scotland via the west or east coast routes. High-speed trains will be capable of accessing some destinations off the high-speed lines using the existing slower speed tracks, using a mixture of high and low speed tracks. TfN has examined two options that make use of HS2 to connect Manchester and Liverpool. Both options involve construction of a new line to Liverpool, and a junction onto the HS2 route. Under these options it would be possible to deliver NPR's ambitions for a 30-minute journey between Manchester and Liverpool, connecting the cities via Manchester Airport. A "passive provision", which is a small section of additional HS2 track, would enable the future construction of Northern Powerhouse Rail (HS3) to link to the HS2 network without disrupting HS2 services once they are running. This will be provided for in the Hybrid Bill. However, as yet there is no firm commitment to a direct HS2 link into Liverpool. The city of Liverpool in February 2016 offered £2 billion towards funding a direct HS2 line into Liverpool's city centre. The nearest proposed HS2 track will be 16 miles (26 kilometres) from the city. In November 2018, it was reported that Transport Secretary, Chris Grayling and Chancellor, Philip Hammond were looking at extending HS2 to Liverpool. Steve Rotheram, the Metro Mayor of the Liverpool City Region, in March 2019 announced the creation of a Station Commission to determine the size, type and location of a new "transport hub" station in Liverpool's city centre, linking with the local transport infrastructure. The station would serve HS2 and Northern Powerhouse Rail trains. The existing Lime Street station is considered too small, with expansion difficult and expensive. Transport for the North's strategic plan recognised the need for a new station to accommodate HS2 and NPR trains, linking HS2 and NPR into the city region’s local transport infrastructure. The Scottish Partnership Group for High Speed Rail in June 2011 campaigned for the extension of the HS2 to Newcastle. In Scotland, business and governmental organisations including Network Rail, CBI Scotland and Transport Scotland (the transport agency of the Scottish Government) formed the Scottish Partnership Group for High Speed Rail in June 2011 to campaign for the extension of the HS2 project north to Edinburgh and Glasgow. It published a study in December 2011 which outlined a case for extending high-speed rail to Scotland, proposing a route north of Manchester to Edinburgh and Glasgow as well as an extension to Newcastle. In 2009, the then Transport Secretary Lord Adonis outlined a policy for high-speed rail in the UK as an alternative to domestic air travel, with particular emphasis on travel between the major cities of Scotland and England. "I see this as the union railway, uniting England and Scotland, north and south, richer and poorer parts of our country, sharing wealth and opportunity, pioneering a fundamentally better Britain," he stated in his speech. In November 2012 the Scottish Government announced plans to build a 74 km (46 mi) high-speed rail link between Edinburgh and Glasgow. The proposed link would have reduced journey times between the two cities to under 30 minutes and was planned to open by 2024, eventually connecting to the high-speed network being developed in England. The plan was cancelled in 2016. In May 2015, it was reported that HS2 Ltd has concluded that there was "no business case" to extend HS2 north into Scotland, and that high-speed rail services would run north of Manchester and Leeds on conventional classic track. Greengauge 21 at the National HSR Conference in Glasgow in September 2015 recommended a mixture of high-speed and existing classic track to Scotland to reduce journey times. This would use planned HS2 track, existing WCML track and sections of newly laid high-speed track. In July 2016 it was reported that the 400-metre-long HS2 trains using the existing classic track will not be accommodated at Glasgow Central or Glasgow Queen Street stations, due to insufficient space to extend the platforms. Extended or new platforms would require compulsory purchase of buildings and land. Instead, the proposals suggested a possible third major station in Glasgow. Proposals to extend HS2 to Scotland via the East Coast have included plans for a new station outside of York. This station could be built on the A59, the A64, outer ring road or Harrogate to York railway line. at Ulleskelf, 8 km (5 mi) southeast of York, joining the existing Church Fenton line, which meets the East Coast Main Line 3 km (2 mi) further north at Colton Junction near Colton. The route to the West Midlands will be the first stage of a line to Scotland, and passengers travelling to or from Scotland will be able to use through trains using a mixture of high-speed and classic tracks with a saving of 45 minutes from day one. It was recommended by a Parliamentary select committee on HS2 in November 2011 that a statutory clause should be in the bill that will guarantee HS2 being constructed beyond Birmingham so that the economic benefits are spread farther. The Department for Transport initially outlined plans to build a two-kilometre-long (1.2 mi) link between HS2 and the existing High Speed 1 line that connects London to the Channel Tunnel. At their closest points, the two high-speed lines will be only 640 m (0.4 mi) apart. This connection would have enabled rail services running from Manchester, Leeds and Birmingham to bypass London Euston and to run directly to Paris, Brussels and other continental European destinations, realising the aims of the Regional Eurostar scheme that was first proposed in the 1980s. Several schemes were considered, and the route finally put forward was a tunnel between Old Oak Common and Chalk Farm, linked to existing "classic speed" lines along the North London Line which would connect to HS1 north of St Pancras. Concerns were raised by Camden London Borough Council about the impact on housing, Camden Market and other local businesses from construction work and bridge widening along the proposed railway link. Alternative schemes were considered, including boring a tunnel under Camden, but the HS1-HS2 link was removed from the parliamentary bill at the second reading stage in order to save £700 million from the budget. High Speed 3 (HS3), a high-speed railway across the North of England was proposed in 2015 by Transport for the North (TfN). The east-west trans-Pennine railway line would provide a high-speed link between northern cities such as Liverpool, Manchester, Leeds, Sheffield, Newcastle and Hull, with connections to HS2. In March 2016 The National Infrastructure Commission's report, "High Speed North", recommended collaboration between TfN and HS2 Ltd. on the design of the northern parts of HS2. Some redesigning would be needed of HS2 to link into HS3. The HS3 rail link was given the go-ahead in the March 2016 budget. The Institute of Public Policy Research on 8 August 2016 urged the government to prioritise HS3 over HS2. Sir David Higgins, head of HS2, explained the collaboration between HS3 and HS2 in a Parliamentary Select Committee in December 2016. He outlined potential schemes being considered for a high-speed connection between Liverpool and Manchester, including a link via Golborne or a southern route via Manchester Airport into Piccadilly station. In 2018 a proposal was put forward by a British engineering consultancy, Expedition Engineering, for HS4Air, a high-speed railway line that would connect HS2 to HS1 via a 140-kilometre (87 mi) route running to the south of Greater London via Heathrow and Gatwick Airports. The proposal was rejected by government in December 2018. HS2 will start from a rebuilt London Euston. The station will be extended to the south and west with significant construction above. Twenty-four platforms will serve High Speed and classic lines to the Midlands, with six underground lines. The connection with Crossrail at Old Oak Common in West London is designed to mitigate the extra burden on Euston, although Euston too would see its underground station rebuilt and integrated with Euston Square. A rapid transit "people mover" link between Euston and St Pancras might be provided and it is proposed to route the proposed Crossrail 2 (Chelsea–Hackney line) via Euston to cope with increased passenger demand. The March 2010 report proposed that a new Birmingham Interchange through station in rural Solihull, on the east side of the M42 motorway from the National Exhibition Centre, Birmingham International Airport and the existing Birmingham International Station. The station will be located at a separate site from the existing Birmingham International Station. Passengers will interchange via a people mover between the stations and the other sites, with a capacity of over 2100 passengers per hour in each direction in the peak period. The AirRail Link people mover already operates between Birmingham International station and the airport. Birmingham Airport's chief executive Paul Kehoe stated that HS2 is a key element in increasing the number of flights using the airport, with added patronage by inhabitants of London and the South East, as HS2 will reduce travelling times to Birmingham Airport from London to under 40 minutes. A new terminus for HS2, termed "Birmingham Curzon Street" in the government's command paper and "Birmingham Fazeley Street" in the report produced by High Speed 2 Ltd, would be built on land between Moor Street Queensway and the site of Curzon Street station. It would be reached via a spur line from a triangular junction with the HS2 main line at Coleshill. The planned site for the new station is immediately adjacent to Moor Street station, and approximately 400 metres (0.25 mi) northeast of New Street station. Passenger interchange with Moor Street would be at street level, across Moor Street Queensway; interchange with New Street would be via a pedestrian walkway between Moor Street and New Street (opened in 2013). [dead link] The other city-centre station, Snow Hill, is a couple of minutes' train journey from Moor Street. HS2 will pass through Staffordshire and Cheshire. The line will run in a tunnel under the Crewe junction by-passing the station. However, the HS2 line will be linked to the West Coast Main Line via a grade-separated junction just south of Crewe, enabling "classic compatible" trains exiting the high-speed line to call at the existing Crewe station. In 2014, the chairman of HS2 advocated a dedicated hub station in Crewe. In November 2015 it was announced that the Crewe hub completion would be brought forward to 2027. In November 2017 the government and Network Rail supported a proposal to build the hub station on the existing station site, with a junction onto the West Coast Main Line north of the station. This will enable through trains to bypass the station via a tunnel under the station and run directly onto the WCML. An HS2 station provisionally named Manchester Interchange is planned to the south of the city of Manchester, serving Manchester Airport. It was recommended in 2013 by local authorities during the consultation stage. Construction will be part-funded by private investment from the Manchester Airports Group. The proposed site is located on the northwestern side of the airport, to the west of the M56 motorway at junction 5, and approximately 2.4 km (1.5 mi) northwest of the existing Manchester Airport railway station. A sub-surface station is planned, approximately 8.5m below ground level, consisting of two central 415m platforms, a pair of through tracks for trains to pass through the station without stopping, a street-level passenger concourse and a main entrance on the eastern side, facing the airport. Current proposals do not detail passenger interchange methods; various options are being considered to integrate the new station with existing transport networks, including extending the Manchester Metrolink Airport Line to connect the HS2 station with the existing airport railway station. If the station is built, it is estimated that the average journey time from London Euston to Manchester Airport would be 59 minutes. The route will continue from the airport into Manchester city centre via a 12.1-kilometre (7.5 mi) twin bore branch tunnel under the dense urban districts of south Manchester before surfacing at Ardwick. The tunnel will be at an average depth of 33 m (108 ft) and trains will travel through it at 228 kilometres per hour (142 mph). The diameter of the tunnel is dependent on the train speed and length of the tunnel. It is envisaged both tunnels will be, as an "absolute minimum", at least 7.25 metres (23 ft 9 in) in diameter to accommodate the high-speed trains. Up to 15 sites were put forward, including Sportcity, Pomona Island, expanding Deansgate railway station and re-configuring the grade-II listed Manchester Central into a station. Three final sites made the long list: Manchester Piccadilly station, Salford Central station and a newly built station at Salford Middlewood Locks. Three approaches were considered, one via the M62, one via the River Mersey and the other through south Manchester. Both Manchester and Salford city councils recommended routing High Speed 2 to Manchester Piccadilly, although the station throat faces southeast away from the incoming HS2 line, to maximise economic potential and connectivity rather than building a new station at a greater cost. HS2, to serve the East Midlands has planned a new through station named the East Midlands Hub located at Toton sidings west of Nottingham. The station will be an out of town parkway station,[note 1] serving the cities of Nottingham, Derby and Leicester. The Derbyshire and Nottingham Chamber of Commerce supports high-speed rail serving the East Midlands, however was concerned that a parkway station instead of centrally located stations in each of the three cities would result in no overall net benefit in journey times. Their concerns are based on the East Midlands Parkway railway station that was recently constructed on the Midland Main Line south of Derby and Nottingham, close to the proposed HS2 site in Toton, which is failing to reach its passenger targets by a substantial margin. HS2 continues north passing Sheffield to the east of the city. Initially there were plans for a direct Sheffield Meadowhall HS2 station, located close to the existing Meadowhall Interchange east of the city. After petitioning by Sheffield City Council the route to the city was changed on 7 July 2016 with high-speed trains serving the centre of the city using classic compatible trains. High-speed trains would branch off HS2 track onto existing classic track south of Sheffield at Clay Cross, north through and serving Chesterfield station and continuing north into Sheffield station. High-speed trains can leave Sheffield and Chesterfield heading north and then branch back onto HS2 track north of the city at Grimethorpe. The proposed city centre station would, according to Sheffield City Council, generate up to £5 billion more for the local economy than a station at Meadowhall, whilst also increasing the station's usage and creating around 6,500 extra jobs, while a Meadowhall station would cause problems with road congestion. HS2 continues north after the branch at Grimethorpe through West Yorkshire toward York, with a spur taking the line into Leeds. It was originally proposed that a separate HS2 station – Leeds New Lane – would be built. However, a later review decided that greater benefits would be obtained by bringing HS2 to the existing Leeds station. HS2 platforms will be built onto the Southern side of the station building creating a common concourse for easy interchange between high speed and classic rail services. Civil engineering works for the actual line are scheduled to commence in June 2019, delayed from the original target date of November 2018. The civil aspect of the construction of Phase 1 is worth roughly £6.6 billion with preparation including over 8,000 boreholes for ground investigation. Work commenced in October 2018 with the demolition of the former carriage sheds at Euston station. The work will allow the start of construction at the throat of the station at Mornington Street bridge, twin-bore 8-mile (13 km) tunnels to West Ruislip. The taxi rank at Euston station was moved to a temporary location at the front of the station in January 2019 so that demolition of the One Euston Square and Grant Thornton House tower blocks could commence. The demolition period is scheduled for ten months. In April 2019, Stagecoach stated its bid had been disqualified from the contest for being non-compliant. The new franchise will run for the first five years of HS2's operation. The Government has not ruled out the possibility of open access operators. There has been no announcement about how HS2 tickets will be priced, although the government said that it would "assume a fares structure in line with that of the existing railway" and that HS2 should attract sufficient passengers to not have to charge premium fares. Paul Chapman, in charge of HS2's public relations strategy, suggested that there could be last minute tickets sold at discount rates. He said, "when you have got a train departing on a regular basis, maybe every five or ten minutes, in that last half hour before the train leaves and you have got empty seats...you can start selling tickets for £5 and £10 at a standby rate." The Department for Transport report on High Speed Rail published in March 2010 sets out the specifications for a high-speed line. It will be built to a European structure gauge (as was HS1) and will conform to European Union technical standards for interoperability for high-speed rail. HS2 Ltd's report assumed a GC structure gauge for passenger capacity estimations, with a maximum design speed of 400 kilometres per hour (250 mph). Initially, trains would run at a maximum speed of 360 kilometres per hour (225 mph). Signalling would be based on the European Rail Traffic Management System (ERTMS) with in-cab signalling, to resolve the visibility issues associated with lineside signals at speeds over 200 kilometres per hour (125 mph). Platform height will be at the European standard of 760 millimetres (2 ft 6 in). The rolling stock for HS2 has not yet been specified in any detail. Bidding for the contract to design and build the trains was opened in 2017 and is expected to be awarded in 2019. There will be 60 trains for Phase 1, each capable of seating 1,000 passengers. The 2010 DfT government command paper outlined some requirements for the train design among its recommendations for design standards for the HS2 network. A photograph of a French AGV (Automotrice à grande vitesse) was used as an example of the latest high-speed rail technology. The paper addressed the particular problem of designing trains to continental European standards, which use taller and wider rolling stock, requiring a larger structure gauge than the rail network in Great Britain. 'Classic compatible' trains, capable of high speed, however built to a British loading gauge permitting the trains to leave the high-speed track to join conventional classic routes such as the West Coast Main Line, Midland Main Line and East Coast Main Line. [note 2] Such trains would allow running of HS2 services to the north of England and Scotland. However these non-tilting trains will run slower than existing tilting trains on classic track. HS2 Ltd has stated that, because these trains must be specifically designed for the British network and cannot be bought "off-the-shelf", these classic-compatible trains were expected to be around 50% more expensive, costing around £40 million per train rather than £27 million for the captive stock. Both types of train would have a maximum speed of at least 350 km/h (220 mph) and length of 200 metres (660 ft). Two units could be joined together for a 400-metre (1,300 ft) train. It has been reported that these longer trains would have approximately 1,100 seats with Andrew McNaughton, technical director of HS2 stating "family areas will alleviate the stress of parents worried that their children are annoying other passengers who are maybe trying to work." A depot will be built in Washwood Heath, Birmingham, covering all of Phase 1 and Phase 2a. In July 2018, the Transport Secretary, Chris Grayling, announced that the maintenance depot for the eastern leg of Phase 2b would be located at Gateway 45 near to the M1 motorway in Leeds. The DfT's latest revised estimates of journey times for some major destinations once the line has been built as far as Leeds and Manchester, set out in the January 2012 document High Speed Rail: Investing in Britain's Future – Decisions and Next Steps, are as follows: Times given for Manchester and Leeds until completion of Phase 2b will be on a mixture of HS2 and classic track. The Department for Transport initially estimated the cost to be £30 billion to be funded by the government with the Manchester Airport station locally funded. The Manchester airport station is to be separately funded by the airport and the wider region. Cost estimates have gradually risen since the first figures were released. The City of Liverpool, omitted from direct HS2 access, may add a third source of funding. In March 2016 the city offered £6 billion to fund a link from the city to the HS2 backbone 20 miles (32 kilometres) away. HS2 received funding from the European Union's Connecting Europe Facility. In June 2013 the projected cost in 2011 prices rose by £10 billion to £42.6 billion, with an extra £7.5 billion budgeted for rolling stock for a total of £50.1 billion. and, less than a week later, it was revealed that the DfT had been using an outdated model to estimate the productivity increases associated with the railway. Peter Mandelson, a key advocate when a study was undertaken of HS2 when the Labour Party was in government, declared shortly thereafter that HS2 would be an "expensive mistake", and also admitted that the inception of HS2 was "politically driven" to "paint an upbeat view of the future" following the financial crash of 2008. He further admitted that the original cost estimates were "almost entirely speculative" and that "[p]erhaps the most glaring gap in the analysis presented to us at the time were the alternative ways of spending £30bn." The link between HS1 and HS2 was later dropped on cost grounds. In April 2016 Sir Jeremy Heywood, a top UK civil servant, was reviewing the HS2 project to trim costs and gauge whether the now £55 billion project could be kept within budget. The cost of HS2 is around 25 per cent higher than the international average, which was blamed on the higher population density and cost of land in a report by PwC. The costs are also higher because the line will run directly into city centres instead of joining existing networks on the outskirts. Until the start of the Great Recession, high-speed rail did not feature high among the priorities of British policy makers and institutional investors: “Britain's best rail transport network, the High-Speed 1 line (HS1 or ‘Channel Tunnel Rail Link’) connecting the country to Paris, [is] a strategic infrastructure asset designed by French engineers, and owned and operated by Canadian pension funds.” However, policy attitudes towards modern transport infrastructure started to change in the early 2010s, notably with renewed interest for the notion of UK pension investment in domestic infrastructure projects jointly with the state. A 2008 paper, 'Delivering a Sustainable Transport System' identified fourteen strategic national transport corridors in England, and described the London – West Midlands – North West England route as the "single most important and heavily used" and also as the one which presented "both the greatest challenges in terms of future capacity and the greatest opportunities to promote a shift of passenger and freight traffic from road to rail". They noted that railway passenger numbers had been growing significantly in recent years, doubling from 1995 to 2015 and that the Rugby – Euston section was expected to have insufficient capacity some time around 2025. This is despite the major WCML upgrade, which was completed in 2008, lengthened trains and an assumption that plans to upgrade the route with cab signalling would be realised. In October 2016, Andrew Jones, a transport minister, suggested renaming HS2 as the 'Grand Union Railway', not to be confused with the Grand Junction Railway (today the West Coast Main Line). His reasoning for this was because HS2 is not about speed and is more about connectivity. There is currently no firm proposal for this name and HS2 remains to be called HS2 or High Speed 2. HS2 has encountered significant support and opposition from various groups and organisations. It is officially supported by the Labour, Conservative, Liberal Democrat parties as well as the Scottish National Party, and opposed by the UK Independence Party and Green Party. Some[who?] Conservative including Liam Fox, Labour and Liberal Democrat politicians do not support their party line, and oppose the HS2 scheme in detail; some support proposals for alternative routes; and some reject the whole principle of high-speed rail. The mayor of London, Sadiq Khan, called for a rethink over the HS2 terminus at Euston preferring Old Oak Common as the London terminus.The Conservative–Liberal Democrat coalition government formed in May 2010 stated in its initial programme for government its commitment to creating a high-speed rail network. Phase 1 will result in the demolition of more than 400 houses; 250 around Euston station, 20–30 between Old Oak Common and West Ruislip, a number in Ealing, around 50 in Birmingham, and the remainder in pockets along the route. No Grade I or Grade II* listed buildings will be demolished, but six Grade II listed buildings will be, with alterations to four and removal and relocation of eight. In Birmingham, the new Curzon Gate student residence will be demolished and Birmingham City University wanted a £30 million refund after the plans were revealed. The Woodland Trust claims that 98 ancient woodlands will suffer loss or be damaged due to HS2, and 34 more will be affected by disturbance, noise and pollution. In England, ancient woods are areas that have been continuously wooded since 1600 and are the country's richest land-based habitat, with a complex and diverse ecology of plants and animals. According to the Trust, 40 hectares (0.4 km2) are threatened with total loss from the construction of phases 1 and 2a, which is 0.01% of England's 340,000 hectares (3,400 km2) of ancient woodlands. To mitigate the loss, HS2 Ltd says that during phase 1 it will plant 7 million trees and shrubs, creating 900 hectares (9 km2) of new woods. The Woodland Trust has called the compensatory tree planting "greenwash nonsense". In 2007 the DfT commissioned a report, Estimated Carbon Impact of a New North-South Line, from Booz Allen Hamilton to investigate the likely overall carbon impact associated with the construction and operation of a new rail line to either Manchester or Scotland; including the extent of carbon dioxide emission reduction or increase from a shift to rail use, and a comparison with the case in which no new high-speed lines were built. The report concluded that there was no net carbon benefit in the foreseeable future, taking only the route to Manchester. Additional emissions from building a new rail route would be larger in the first ten years at least, when compared to a model where no new line was built. The 2006 Eddington Report cautioned against the common argument of modal shift from aviation to high-speed rail as a carbon-emissions benefit, since only 1.2% of UK carbon emissions are due to domestic commercial aviation, and since rail transport energy efficiency is reduced as speed increases. The 2007 Government White Paper Delivering a Sustainable Railway stated trains that travel at a speed of 350 kilometres per hour (220 mph) used 90% more energy than at 200 kilometres per hour (125 mph); which would result in carbon emissions for a London to Edinburgh journey of approximately 14 kilograms (31 lb) per passenger for high-speed rail compared to 7 kilograms (15 lb) per passenger for conventional rail; air travel emits 26 kilograms (57 lb) per passenger for the same journey. The paper questioned the value for money of high-speed rail as a method of reducing carbon emissions, but noted that with a switch to carbon-free or carbon-neutral energy production the case becomes much more favourable. The House of Commons Transport Select Committee Report in November 2011 (paragraph 77) concluded that the Government's claim that HS2 would have substantial carbon reduction benefits did not stand up to scrutiny. At best, the Select Committee found, HS2 could make a small contribution to the Government's carbon-reduction targets. However this was dependent on making rapid progress in reducing carbon emissions from UK electricity generation. The revision of the route through South Yorkshire, which replaced the original plans for a station at Meadowhall for a station off the HS2 tracks at Sheffield was cited as a major reason for the collapse of the Sheffield City Region devolution deal; Sheffield City Council's successful lobbying for a city-centre station in opposition to Barnsley, Doncaster, and Rotherham's preference to the Meadowhall option caused Doncaster and Barnsley councils to seek an all-Yorkshire devolution deal instead. During the construction of HS2, what is being described as the largest archaeology programme ever undertaken in the UK will take place. Over 1000 archaeologists will explore 60 sites across the HS2 route spanning 10,000 years of the UK's history. Early discoveries were two Victorian era time capsules found during the demolition of the National Temperance Hospital in Camden and Prehistoric flints found in Hillingdon. The long lost remains of the famous explorer Captain Matthew Flinders were discovered during excavations at the former burial ground of St James's Church, Piccadilly, which was some distance from the church, next to Euston railway station. His remains were identified from his lead coffin plate during the excavation of around 40,000 skeletons that were buried underneath the station. It is proposed to re-bury the remains, at a site to be decided, after they have been examined by osteo-archaeologists. ^ The British Rail Class 373 trains used by Eurostar are an example of a high-speed train that is compatible with French/Belgian high-speed lines and British lines. ^ "High Speed 2 (HS2) Railway - Railway Technology". ^ "FactCheck Q&A: How does HS2 compare to other bullet trains?". ^ a b c "High Speed Two From Concept to Reality July 2017" (PDF). GOV.UK. Department for Transport. Retrieved 18 November 2017. ^ "HS2: Phase 1 of high-speed rail line gets go-ahead". BBC News. 10 January 2012. ^ "Go-ahead given to new railway". Department for Transport. January 2012. ^ HIGH SPEED TWO PHASE ONE INFORMATION PAPER F1: ROLLING STOCK DEPOT AND STABLING STRATEGY (PDF) (Report). HS2 Ltd. 23 February 2017. p. 3. Retrieved 13 February 2018. ^ "CHAPTER 2: THE COST OF HS2". ^ "Constructing the HS2 railway". GOV.UK. 23 August 2017. Retrieved 18 November 2017. ^ Britain’s Transport Infrastructure High Speed Two (PDF). DfT. January 2009. p. 5. ISBN 978 1 906581 80 0. Archived from the original (PDF) on 3 February 2010. Retrieved 17 December 2017. ^ "Transport secretary unveils HS2 compensation plan". Railnews. Stevenage. 29 November 2010. ^ a b "London-to-Birmingham high speed train route announced". BBC News. 20 December 2010. ^ "'Redrawn' high speed rail plan unveiled". Channel 4 News. 20 December 2010. ^ "High Speed Rail – Oral Answers to Questions – Education – House of Commons debates". 20 December 2010. question to the Minister by Maria Eagle, shadow secretary for Transport, 1st para. ^ a b "Britain to have new national high-speed rail network". ^ "HS2 Hybrid Bill receives Royal Assent". ^ "Oral statement to Parliament, HS2 update: Phase 2a and Phase 2b". GOV.UK. 18 July 2017. Retrieved 17 December 2017. ^ "Glossary of terms and list of abbreviations". gov.uk. DfT. Retrieved 15 October 2018. ^ "HS2 Phase 2a: economic case – Publications". GOV.UK. 30 November 2015. Retrieved 26 August 2016. ^ "High Speed Two: From Crewe to Manchester, the West Midlands to Leeds and beyond" (PDF). ^ a b c Nick Giesler et al., for Environmental Resources Management (ERM). "HS2 Phase Two Initial Preferred Scheme : Sustainability Summary, section 4.2.13" (PDF). High Speed Two (HS2) Limited. p. 21. ^ "Government pledge on Sheffield rail line amid HS2 'funding gap' fear". ^ a b "Counting the real cost of HS2 Meadowhall station plan". The Star. Retrieved 2 August 2016. ^ a b "Violent outbursts at Doncaster HS2 meeting". BBC News. Retrieved 2 August 2016. ^ "HS2 South Yorkshire route change threatens new estate". BBC News. Retrieved 2 August 2016. ^ "Council claim victory over Sheffield HS2 station move". BBC News. Retrieved 2 August 2016. ^ "Chesterfield - High Speed 2". ^ "HS2 phase two initial preferred route plan and profile maps". Transport planning and infrastructure. Department for Transport. January 2013. Retrieved 2 February 2013. 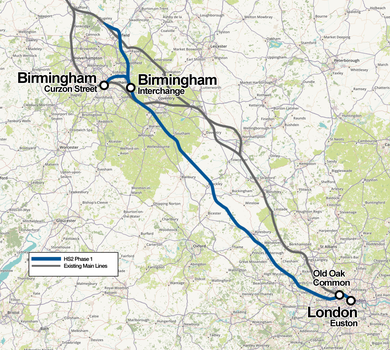 ^ "Proposed high speed rail network North of Birmingham confirmed" (Press release). Department for Transport. 4 October 2010. Archived from the original on 6 July 2011. Retrieved 7 October 2010. ^ a b "The Yorkshire Hub" (PDF). Department for Transport. p. 10. Retrieved 30 November 2015. ^ "Transport Secretary will consider a possibility of a 'South Yorkshire Hub'". 4 October 2016. Retrieved 9 October 2016. ^ "South Yorkshire Route Document" (PDF). July 2016. Retrieved 9 October 2016. ^ "Head of HS2 backs South Yorkshire Parkway – Proposed Railway Schemes". Proposed Railway Schemes. 16 December 2016. Retrieved 16 December 2016. ^ "HS2: Eight 'parkway' station proposal sites revealed". 25 January 2017 – via www.bbc.co.uk. ^ "MPs to press for M18 station to serve HS2 line". www.yorkshirepost.co.uk. ^ "Leaders campaign for HS2 'parkway' station in South Yorkshire". ^ "HS2 boss: South Yorkshire politicians must decide 'M18 route' parkway station location". ^ "High Speed 2 (HS2) Phases 2a, 2b and beyond" (PDF). ^ "Government confirms provision to join HS2 and Northern Powerhouse Rail for Liverpool City Region – Liverpool BID Company". www.liverpoolbidcompany.com. ^ Topham, Gwym (23 February 2016). "Liverpool offers £2bn to be included in HS2 network". The Guardian. Retrieved 14 March 2016. ^ "HS2 could be extended to Liverpool from Manchester under plans being considered by Chris Grayling and Philip Hammond". www.yorkshirepost.co.uk. Retrieved 6 January 2019. ^ a b Fast Track Scotland: Making the Case for High Speed Rail Connections with Scotland (PDF). Scottish Partnership Group for High Speed Rail. December 2011. p. 10. ISBN 9781908181213. ^ "HS2 will be the 'Union Railway' of England and Scotland – Adonis". Railnews. 29 September 2009. Archived from the original on 24 September 2015. Retrieved 24 September 2015. ^ "High-speed rail plan for Glasgow to Edinburgh line". BBC News. 12 November 2012. Retrieved 30 January 2013. ^ "High speed Glasgow-Edinburgh rail link plans 'shelved'". BBC News. 15 January 2016. Retrieved 16 January 2017. ^ Leftly, Mark (24 May 2015). "SNP fury as HS2 finds 'no business case' for taking fast train service to Scotland". The Independent. Archived from the original on 24 July 2015. Retrieved 24 September 2015. ^ "The key policy choices for Anglo-Scottish HSR" (PDF). Greengauge 21. September 2015. Retrieved 1 December 2015. ^ "Warnings Glasgow City Centre will need a third major station in less than twenty years". Evening Times. Glasgow. 14 July 2016. Retrieved 31 July 2016. ^ "Calls to scrap plans for HS2 station that would bypass York". York Press. ^ a b c "High speed rail: investing in Britain 's future phase two – the route to Leeds, Manchester and beyond summary" (PDF). DfT. 23 January 2013. pp. 5, 16–17. Retrieved 13 May 2014. ^ DfT 2009, p. 16 para. 37. ^ Savage, Michael (2 February 2010). "Adonis in all-party talks on high-speed rail link". The Independent. London. Retrieved 4 January 2010. ^ "Conclusions and recommendations – conclusions and the way ahead". UK Parliament. 1 November 2011. Retrieved 6 January 2012. ^ "3. HS1-HS2 Link" (PDF). HS2 London – West Midlands Design Refinement Consultation. Department for Transport. May 2013. p. 21. Archived from the original (PDF) on 12 May 2014. Retrieved 12 May 2014. ^ DfT 2010, p. 9. ^ "High Speed Rail: Oral statement by: The Rt Hon Philip Hammond MP". Department for Transport. 20 December 2010. Archived from the original on 23 December 2010. ^ "New High Speed Rail Proposals Unveiled" (Press release). Department for Transport. 20 December 2010. Archived from the original on 24 December 2010. ^ Arup (20 December 2010). "Review of HS1 to HS2 Connection Final Report" (PDF). Department for Transport. Section 2.1 "Structural modifications" , p.4. Archived from the original (PDF) on 7 July 2011. ^ "Plan of the route connecting HS2 to HS1 showing which map covers which area – drawing number HS2-ARP-00-DR-RW-05140" (PDF). Arup/DfT. 5 January 2012. Retrieved 12 May 2014. ^ "HS2's cost to Camden". London Borough of Camden. July 2013. Archived from the original on 13 May 2014. Retrieved 12 May 2014. ^ "HS2 plans 'threaten jobs' in Camden's markets". BBC News. 21 November 2013. Retrieved 12 May 2014. ^ "London mayor Boris Johnson calls for tunnel to link HS2 at Euston to St Pancras". Evening Standard. 22 April 2014. Retrieved 12 May 2014. ^ "High Speed Rail (London – West Midlands) Bill". Hansard. UK Parliament. 28 April 2014. Retrieved 12 May 2014. ^ "Budget 2016: HS3 and wider M62 announced". BBC News. 16 March 2016. ^ "IPPR urges government to prioritise HS3 link – BBC News". Bbc.co.uk. Retrieved 26 August 2016. ^ "Progress of High Speed Two examined". ^ Smale, Katherine. "HS4Air plan to link Heathrow and Gatwick rejected". New Civil Engineer. Archived from the original on 11 December 2018. Retrieved 11 December 2018. ^ "HS2 fuels Crossrail 2 business case". Transportxtra.com. Retrieved 28 October 2013. ^ a b c Harris, Nigel (28 July 2010). "'No business case' to divert HS2 via Heathrow, says Mawhinney'". Rail (649). Peterborough. pp. 6–7. ^ DfT 2010, p. 107. ^ DfT 2010, p. 118. ^ "High Speed Two Phase One Information Paper H2: Birmingham Interchange Station" (PDF). gov.uk. High Speed Two (HS2) Limited. 23 February 2017. pp. 3, 10. Retrieved 23 May 2018. ^ Nielsen, Beverley (29 October 2010). "Up, Up and Away – Birmingham Airport spreads its wings as powerful driver of growth and jobs". Birmingham Post Business Blog. ^ DfT 2010, p. 112. ^ "3". High Speed Rail: London to the West Midlands and Beyond. A Report to Government by High Speed Two Limited (PDF). p. 117. Archived from the original (PDF) on 9 April 2010. Retrieved 12 March 2010. ^ "The first half of the new concourse at Birmingham New Street station will open on 28 April 2013". Network Rail. Archived from the original on 22 June 2013. Retrieved 2 November 2013. ^ "High Speed Two Information Paper H4: Birmingham Curzon Street Station" (PDF). gov.uk. High Speed Two (HS2) Limited. pp. 4.1 and 6.3. Archived from the original (PDF) on 4 September 2018. Retrieved 23 May 2018. ^ Network Rail. Transforming Birmingham New Street. Archived from the original on 28 August 2010. Retrieved 28 October 2012. ^ a b Walker, Jonathan (16 March 2010). "Birmingham City University wants £30m refund after high speed rail hits campus plan". Birmingham Post. Archived from the original on 23 March 2010. Retrieved 17 March 2010. ^ DfT 2010, p. 115. ^ Ikon Gallery. Curzon Square – A vision for Birminghams New Museum Quarter (PDF). Archived from the original (PDF) on 13 May 2013. Retrieved 28 October 2012. ^ a b Millward, David (6 January 2013). "HS2 route: Manchester and Liverpool win while Sheffield loses out". The Telegraph. London. Retrieved 27 January 2013. ^ "Stoke-on-Trent 'ignored' under HS2 rail route plans". BBC News. 28 January 2013. Retrieved 2 February 2013. ^ "Route section HSM09 plan and profile sheet 2 of 2 – drawing number HS2-MSG-WCM-ZZ-DT-RT-60902" (PDF). HS2 phase two initial preferred route plan and profile maps. Department for Transport. January 2013. Retrieved 2 February 2013. ^ "UPDATE: HS2 in Crewe by 2027 – chairman backs Crewe hub station plan (From Crewe Guardian)". Creweguardian.co.uk. 17 March 2014. Retrieved 29 April 2014. ^ "HS2 Birmingham to Crewe link planned to open six years early". BBC News. 30 November 2015. Retrieved 1 December 2015. ^ "Route section HSM28 plan and profile sheet 5 of 9 – drawing number HS2-MSG-MA0-ZZ-DR-RT-52805" (PDF). HS2 phase two initial preferred route plan and profile maps. Department for Transport. January 2013. Retrieved 2 February 2013. ^ "Council chiefs lobby ministers for TWO high speed rail stations". Manchester Evening News. 22 January 2013. Archived from the original on 18 May 2013. Retrieved 27 January 2013. ^ a b "Manchester Airport may be high-speed rail network hub". Manchester Evening News. 13 March 2011. Archived from the original on 16 March 2011. Retrieved 11 March 2012. ^ "High Speed Two Phase 2b Crewe to Manchester Route Engineering Report: 4.2 Manchester Airport High Speed Station" (PDF). Dft/High Speed Two (HS2) Limited. July 2017. p. 53. Retrieved 26 May 2018. ^ "Manchester Airport High Speed Station" (PDF). UK Government website. High Speed Two (HS2) Limited. 2013. Archived (PDF) from the original on 18 December 2017. Retrieved 18 December 2017. ^ Department for Transport (2013). High Speed Rail: Investing in Britain's Future – Phase Two, the Route to Leeds, Manchester and Beyond. The Stationery Office. p. 38. ISBN 9780101850827. Retrieved 18 December 2017. ^ "Hopes for 'western loop' tram line". BBC News. 31 October 2014. Archived from the original on 18 December 2017. Retrieved 18 December 2017. ^ Cox, Charlotte (19 March 2018). "This is how Manchester Airport's HS2 station could look". men. Archived from the original on 26 May 2018. Retrieved 26 May 2018. ^ Arnett, George (17 March 2014). "How will HS2 change journey times to and from London?". The Guardian. Archived from the original on 18 December 2017. Retrieved 18 December 2017. ^ "Options for Phase 2 of the High Speed rail network". 28 January 2013. p. 96. Retrieved 8 March 2017. ^ "HS2 to enter Manchester via tunnel under city". BBC News. 28 January 2013. Retrieved 28 January 2013. ^ "Options for Phase Two" (PDF). 28 January 2013. p. 9. Retrieved 2 February 2013. ^ "HS2 Cost and Risk – Infrastructure rate comparison" (PDF). 28 January 2013. p. 24. Retrieved 2 February 2013. ^ "Options for Phase 2 of the High Speed rail network". 28 January 2013. p. 110. Retrieved 8 March 2017. ^ "Options for High Speed Two Phase 2" (PDF). 28 January 2013. p. 120. Retrieved 30 January 2013. ^ "Options for Phase 2 of the High Speed rail network". 28 January 2013. p. 120. Retrieved 8 March 2017. ^ a b "New 'parkway' station could be built in East Midlands". Nottingham Evening Post. 3 December 2009. Archived from the original on 5 May 2013. Retrieved 4 January 2010. ^ "East Midlands Parkway railway station fails to meet target". BBC News Online. 29 June 2013. Retrieved 28 November 2013. ^ "HS2 South Yorkshire route change threatens new estate – BBC News". Bbc.co.uk. Retrieved 26 August 2016. ^ "HS2: Spur to take high-speed trains into Sheffield – but Yorkshire faces long wait until 2033". ^ Simpson, Jack (19 July 2018). "HS2 civils start delayed another three months". Construction News. ^ "First look at HS2's Euston tunnel portal site". High Speed Two (HS2) Limited. 4 October 2018. ^ "Euston Station Throat (C221-MMD-CV-DPP-010-200500-FPD)" (PDF). gov.uk. Retrieved 13 October 2018. ^ "Euston HS2 works ramp up with towers demolition". ^ "The economic case For HS2" (PDF). Department for Transport. October 2013. pp. 39, 42. Archived from the original (PDF) on 1 June 2016. Retrieved 1 May 2016. ^ "West Coast Mainline and HS2 franchise race started". New Civil Engineer. 29 March 2018. Retrieved 2 April 2018. ^ "West Coast Partnership and South Eastern rail franchise bidders - GOV.UK". www.gov.uk. Retrieved 7 March 2018. ^ "New West Coast rail franchise to run HS2 services". 4 November 2016 – via www.bbc.co.uk. ^ "West Coast franchise winner to be handed HS2 deal". ^ "West Coast franchise winner 'will run first HS2 trains'". ^ "Government has 'not ruled out' open access on HS2". ^ "West Coast main line franchise announced as HS2 operator". ^ "New rail franchise to run HS2 and West Coast Mainline". ^ "High-speed rail's long journey". 17 March 2014. ^ "HS2 tickets could cost as little as five pounds". 20 November 2013. ^ a b McCann, Kate. "HS2 should be renamed 'Grand Union Railway'". Retrieved 14 August 2017. ^ "Competition is key as high speed rail keeps growing". ^ DfT 2010, p. 127 s.8.4. ^ HS2 Report 2010, p. 40–41 Chapter 2, section 2.3.11. ^ DfT 2010, p. 127. ^ a b c d DfT 2010, p. 129. ^ "About High Speed Rail". High Speed 2 Ltd. Table 3. Archived from the original on 14 March 2010. Retrieved 9 February 2011. ^ DfT 2010, p. 130. ^ "Search underway for company to build HS2 trains in £2.75 billion government rail investment". www.gov.uk. Department for Transport and High Speed Two (HS2) Limited. 20 January 2017. Retrieved 17 February 2018. ^ "HS2 trains will never be late, claims boss". ^ "Tilting trains could run from HS2 onto the rest of the rail network". www.imeche.org. ^ HS2 Ltd. "HS2 Cost and Risk Model Report" (PDF). p. 20. Retrieved 30 December 2015. ^ "Rolling Stock Maintenance Depot (Washwood Heath Depot)". hs2inbirmingham.commonplace.is. Retrieved 31 March 2018. ^ "HS2 depot to be located in Leeds". BBC News. 4 July 2018. Retrieved 4 July 2018. ^ "HS2 eastern leg rolling stock depot confirmed for Leeds". Rail Technology Magazine. 4 July 2018. Retrieved 8 July 2018. ^ HS2 Phase One Environmental Statement - Non-technical summary (PDF) (Report). DfT. November 2013. pp. 20, 27. Retrieved 21 October 2018. ^ "High Speed Rail (Crewe to Manchester and West Midlands to Leeds) Working Draft Environmental Statement Non-technical Summary" (PDF). gov.uk. DfT. Retrieved 21 October 2018. ^ High Speed Rail: Investing in Britain's Future – Decisions and Next Steps (PDF). Cm 8247. Department for Transport. January 2012. ISBN 9780101824729. ^ HS2 Phase 1 Environmental Statement Non-technical summary (PDF) (Report). Department for Transport. November 2013. p. 27. Retrieved 16 January 2018. ^ a b "JOURNEY TIMES AND FREQUENCIES" (PDF). Archived from the original (PDF) on 24 May 2018. Retrieved 1 May 2017. ^ "Victory for HS2 campaign in boost for Chesterfield – Toby Perkins MP - Toby Perkins MP". www.tobyperkins.org.uk. ^ "Trains Chesterfield to Birmingham New Street - Train Timetables & Cheap Tickets". www.thetrainline.com. ^ Topham, Gwyn (23 February 2016). "Liverpool offers £2 billion to be included in HS2 network". The Guardian. London. Retrieved 14 March 2016. ^ News (15 July 2015). "HS2 secures EU funding". ^ a b "High-speed rail plans announced". BBC News. 11 March 2010. ^ Adonis, Andrew (1 March 2011). "High Speed 2 costs less than main line upgrades (Letter)". Financial Times. London. Retrieved 26 March 2013. ^ Topham, Gwyn (26 June 2013). "Cost of HS2 up £10bn to £42.6bn, transport secretary tells MPs". The Guardian. London. Retrieved 1 July 2013. ^ Pickard Jim (1 July 2013). "Growth of handheld computers hits economic argument for HS2". Financial Times. London. Retrieved 1 July 2013. ^ Pickard, Jim (2 July 2013). "Mandelson fears HS2 will prove an 'expensive mistake'". Financial Times (London). Retrieved 24 July 2013. ^ Batty, David (2 July 2013). "Lord Mandelson warns HS2 will be an 'expensive mistake'". The Guardian (London). Retrieved 24 July 2013. ^ Mark Leftly. "Top UK civil servant reviews HS2 project | UK news". The Guardian. Retrieved 26 August 2016. ^ Firzli, M. Nicolas J. "Transportation Infrastructure and Country Attractiveness Q3 2013". Revue Analyse Financière. Paris. Retrieved 8 March 2017. ^ "Delivering a Sustainable Transport System (DaSTS)" (PDF). Department for Transport. November 2008. Archived from the original (PDF) on 30 December 2008. ^ DfT 2009, p. 12 para. 31. ^ "GB rail: dataset on financial and operational performance 1997–98 – 2012–13" (PDF). Association of Train Operating Companies. Archived from the original (PDF) on 6 July 2017. Retrieved 1 December 2015. ^ DfT 2009, p. 5 para. 6. ^ DfT 2009, p. 12 para. 34. ^ "HS2 isn't about reducing CO2 or the North–South divide, says DfT". TransportXtra. London. 20 January 2012. ^ DfT 2009, p. 4 para. 5. ^ DfT 2009, p. 17 para. 41. ^ DfT 2009, p. 18 para. 43. ^ DfT 2009, p. 16 para. 36. ^ "High speed rail concerns 'exaggerated' says Philip Hammond". MSN News UK. 14 April 2011. Retrieved 26 March 2013. ^ "Sadiq Khan calls for rethink over HS2 terminus at Euston". ^ "Sadiq Khan says HS2 'must find solution' to Euston terminus plans". ^ "The Coalition: our programme for government" (PDF). HM Government. May 2010. p. 31. Archived from the original (PDF) on 12 June 2011. ^ Walker, Peter (11 March 2010). "Beauty of Chilterns may be put at risk by fast rail link, say critics". The Guardian. London. ^ a b Milmo, Dan (7 January 2011). "High-speed rail route to get 2m trees for shelter". The Guardian. London. ^ a b "Appraisal of Sustainability: A Report for HS2 Non Technical Summary" (PDF). Department for Transport. December 2009. Archived from the original (PDF) on 17 April 2012. ^ HS2 Phase One Environmental Statement Non-technical summary (PDF). Department for Transport. November 2013. p. 45. Retrieved 14 January 2018. ^ High Speed 2(2010), page 118. ^ "Phase 2a – Take action now". Woodland Trust. Retrieved 19 August 2017. ^ a b "Protection of Ancient Woodland and Trees". Parliamentary Debates (Hansard). 603. United Kingdom: House of Commons. 10 December 2015. col. 414WH–442WH. ^ Dean Kirby (25 June 2018). "HS2 woodland plans 'are like replacing a Ming vase with cheap crockery'". iNews. Retrieved 26 June 2018. ^ "HS2 launches plans for unprecedented 'green corridor' stretching alongside the railway". Gov.uk. 25 June 2018. Retrieved 26 June 2018. ^ Smith, Dee. "HS2 green corridor nothing more than greenwash nonsense". Woodland Trust Press Centre. ^ "House of Commons Hansard Debates for 08 December 2009 (pt 0006)". Parliamentary Debates (Hansard). United Kingdom: House of Commons. 8 December 2009. col. 31WH—continued. Retrieved 4 January 2010. ^ "High Speed 2". Chilterns Conservation Board. ^ "West Midlands Map 4" (PDF). High Speed 2. Department for Transport. Archived from the original (PDF) on 1 April 2010. Retrieved 15 April 2010. ^ BAH 2007, p. 6, s.1.20. ^ DfT 2010, p. 53, s.2.57. ^ "The Eddington Transport Study, The case for action: Sir Rod Eddington's advice to Government" (PDF). December 2006. Figure 15: The case for new very High Speed Lines (HSLs) p.49 (also p.33). Archived from the original (PDF) on 28 July 2011. ^ a b "Delivering a Sustainable Railway" (PDF). Department for Transport. July 2007. Section 6.14 – 6.17, pp.62–3. Archived from the original (PDF) on 9 April 2010. ^ "HS2 Exceptional Hardship Scheme consultation document" (PDF). Department for Transport. ^ "Property and Compensation Consultation". HS2 Ltd. 28 January 2013. Archived from the original on 23 April 2013. ^ a b "Property and compensation scheme consultation schedule" (Press release). HS2 Ltd. 28 January 2013. Archived from the original on 15 June 2013. ^ "High Speed Rail". Civic Voice. n.d.
^ Philip Hammond, Secretary of State for Transport (28 June 2010). "House of Commons Hansard Written Answers for 28 Jun 2010 (pt 0003)". Parliamentary Debates (Hansard). United Kingdom: House of Commons. col. 364W. ^ "The EHS announcement". HS2 Action Alliance. 2010. Archived from the original on 11 September 2011. ^ "'How HS2 Sheffield Station saga helped derail devolution hopes'". Yorkshire Post. Retrieved 24 September 2017. ^ "Sir Steve Houghton: why I pulled Barnsley out of £900m Sheffield City Region devolution". The Star. Retrieved 24 September 2017. ^ "Remains of Captain Matthew Flinders discovered at HS2 site in Euston". UK Government. 25 January 2019. Retrieved 26 January 2019. ^ "Rail dig finds explorer Flinders' remains". 25 January 2019. Retrieved 25 January 2019. ^ "HS2 Archaeology". High Speed 2. Retrieved 25 January 2019. ^ Addley, Esther (24 January 2019). "Grave of Matthew Flinders discovered after 200 years near London station". The Guardian. Retrieved 24 January 2019. Booz Allen Hamilton Ltd (2007). "Estimated Carbon Impact of a New North South Line" (PDF). Department for Transport. Archived from the original (PDF) on 20 January 2010. Atkins (2009). "High Speed Line Study: Summary Report" (PDF). Department for Transport. Archived from the original (PDF) on 9 April 2010. Retrieved 13 March 2010. DfT (2009): Britains Transport Infrastructure High Speed Two (PDF). Department for Transport. 2009. ISBN 978-1-906581-80-0. Archived from the original (PDF) on 13 May 2010. Retrieved 8 March 2017. HS2 (2010): High Speed Two Ltd (11 March 2010). "High Speed Rail London to the West Midlands and Beyond: A Report to Government by High Speed Two Limited". Department for Transport. Archived from the original on 17 March 2010. Retrieved 16 March 2010. Additional archives: 13 May 2010. HS2 Phase One (2012 Maps): High Speed Two Ltd (10 January 2012). "HS2 revised line of route maps". Department for Transport. Archived from the original on 17 March 2014. Retrieved 30 October 2012. HS2 Phase Two (2013 Maps): High Speed Two Ltd (28 January 2013). "HS2 Phase Two initial preferred route plan and profile maps". Department for Transport. Archived from the original on 14 February 2014. Retrieved 10 May 2014. This page was last edited on 24 April 2019, at 17:51 (UTC).